★[EXTRALARGE CAPACITY]---Measures 380 mm (15 in) in height and 260 mm (10.3 in) in diameter (base) when assembled; accommodates all of your jewelry, cosmetics, makeup brushes, skincare products, lipsticks, nail polish, eyeliner and more in extra large containers, saves you counter space and keep your countertop, dresser and vanity tidy. 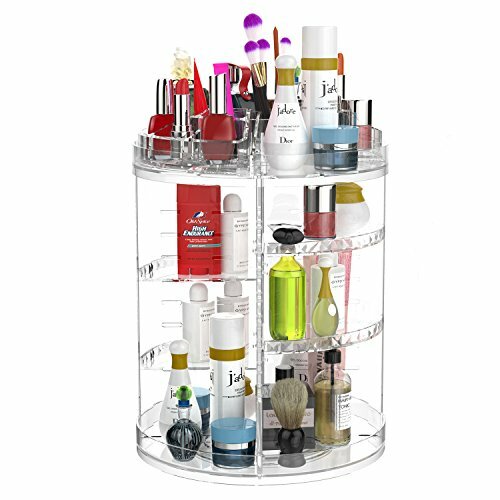 ★[PREMIUM QUALITY]--Steady and sturdy base plate keeps cosmetics together and rotates smoothly and silently to ensures good load-bearing capacity. ★[EASY TO INSTALL & WASHABLE]---Easy to assemble, disassemble and clean. Any product quality problems, please contact us by Amazon mailbox (boxalls.us@outlook.com) at any time, best service for you! I have needed this for soooo long! Excellent for keeping your makeup organized.